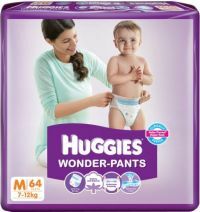 New Huggies Wonder-Pants is the softest^ diaper pant! Your baby's skin is delicate and that's why it needs extra care. Ordinary diaper-pants keep your baby dry but they may not be gentle on your baby's fragile skin! Hence we have made a diaper pant with a "Soft-Hug Design" which is gentle on baby's delicate skin. Diapers have become one of the biggest concerns for parents because though they are a very convenient tool, diaper rashes are also a big concern. Choosing the right diaper should be at the top of your list because when it’s about hygiene, you want to choose best for your baby. With Huggies Wonder Pants you can make the diaper experience enjoyable for both of you. Bed time is very essential for a child’s growth. These diaper pants help your child to sleep uninterrupted. It is gentle on your baby’s skin and ensures maximum dryness even after repeated wetting. The cotton soft- hug design of Huggies is made of breathable material that that beautifully hugs the baby’s bottom, keeping it soft all the time. The presence of cottony soft material makes the diapers gentle, so that kids don’t feel uncomfortable in any way. These wonder pants are widely preferred by parents because it keeps the child’s skin healthier. Besides its quick-lock system effectively controls the leakage and keeps your baby’s sensitive skin free of rashes, redness and other irritants and the non-sticky elastic waistband holds the diaper more securely to ensure that your baby’s natural movements are not interrupted. Just by tearing the sides you can remove the soiled diapers giving you and your child a hassle free diaper change experience. So, what are you waiting for? Let your baby enjoy peaceful sleep with comfortable Huggies Wonder Pants. This pack of Huggies is formulated with a speed-dry layer and leak-lock system that uniformly spreads the fluid throughout the pad and locks it into the absorbent core. Store the pack of diaper pants in a dry place to keep its freshness intact. 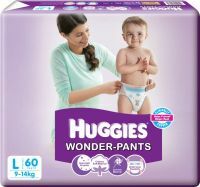 To Recieve updates and possible rewards for Huggies Wonder Pants Small Size Diapers please sign in. To Recieve updates and possible rewards for Diapers & Nappies please sign in.